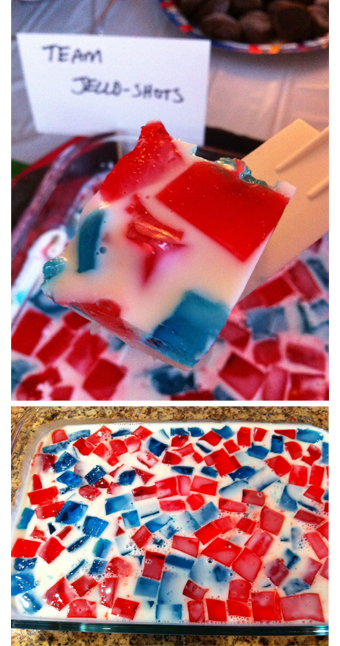 I made these Giants and Patriots jell-o shot squares this Sunday for our Super Bowl Party. The great part about this recipe is that you can tailor it to any team colors you wanted. They are perfect for gameday and tailgating. As well as Fourth of July parties. I used the recipe from Jelly Shot Test Kitchen. Pour water into a small saucepan and sprinkle with gelatin. Allow to soak for a minute of two. Heat over low heat, stirring constantly, until gelatin is dissolved (about 5 minutes). Pour the flavored gelatin powder into two separate bowls. Divide the hot gelatin mixture and add one part to each bowl. Stir until dissolved. Let cool for a few minutes, then stir in the liquor. Pour into four separate containers to chill - in order to have relatively symmetrical gelatin blocks. Chill until fully set, several hours or overnight. Pour water into a medium saucepan and sprinkle with the gelatin. Allow to soak for a minute or two. Heat over low heat, stirring constantly, until gelatin is dissolved (about 5 minutes). Stir in the can of condensed milk. Set mixture aside to cool to room temperature. Remove the colored gelatin from the refrigerator and cut into small blocks. Carefully mix the blocks as desired and place in a 9 x 13 glass pan. Return blocks to refrigerator until milk mixture is cool. Once the milk mixture is cooled, pour it over the gelatin blocks. Skim off any small bubbles that form. Chill until fully set, several hours or overnight. To serve, cut into squares. How do you tailor this to a Cleveland Browns gelatin shot? Is there brown gelatin? Unfortunately they do not make brown gelatin. According to this page, (http://www.answers.com/Q/How_do_you_make_a_jello_brown) you can use Black cherry Jell-O with several drops of green and yellow food coloring.